Zusana Licko’s 1996 typeface quickly became a favorite of mine after studying it for this series of type specimen cards. While there’s a history behind every typeface, Mrs Eaves’ back story is especially compelling: a revival of the classic Baskerville, by a designer famous for digital faces. What’s more, I learned it had 213 ligatures ranging from the functional to the fanciful, a thrill for any budding typographer. Mrs Eaves, it seemed, was a woman of many talents. The least I could do was to introduce her as well as I could. A tribute to Mrs Eaves: a classic face with a modern twist. Create a typographic cardset, introducing a unique typeface and its family. The goal is to promote it in a modern, interesting way, almost like presenting a type specimen in a form of individual cards rather than a book or a booklet. The idea was to take the traditional and introduce a modern twist. In these cards, the traditional serifs of Mrs Eaves are juxtaposed against bright pops of neon pink and orange. 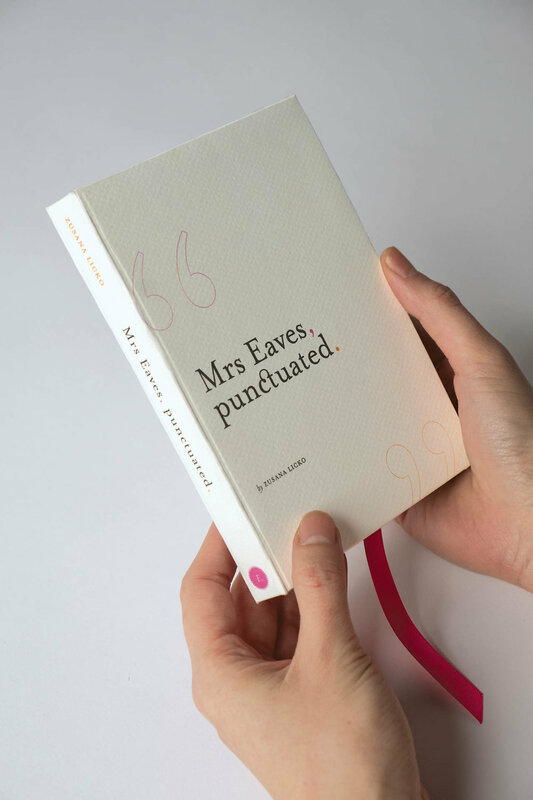 Mrs Eaves has such a lyrical quality to it, to the choice was made to focus on its punctuation and symbols, and package the set in book box.